Aroma: Super ripe red raspberries, cloves, mocha and licorice are some of the many notes that emerge from the 2012 Cabernet Sauvignon Estate Reserve. Palate: The 2012 Cabernet Sauvignon Estate Reserve flows across the palate with layers of expressive dark red fruit, spices, new leather and licorice. The style is rich and enveloping throughout, with notable silkiness and exceptional polish. Hints of white pepper and orange peel add an attractive upper register on the finish. Here the fruit is a bit more red-toned than in either the 2010 and 2011. 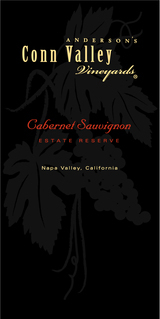 The 2012 Cabernet Sauvignon Estate Reserve exhibits classic crème de cassis, graphite and spice box notes as well as terrific purity, plenty of depth and ripeness, and a full-bodied mouthfeel. In the past, this cuvée has been highly successful as well as very ageworthy. The 2012 is another beauty. Juicy and filled with cassis fruit, it is still primary, but promises to keep for two decades or more.